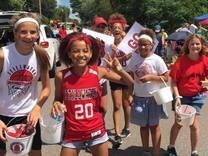 Pony E-News: Summer Tuesdays, Lumberjack Days and Oklahoma! Come visit Stillwater Area Public Schools downtown at Summer Tuesdays July 11 - August 15. We'll have a booth set up from 5-8:30 p.m. where you can write a note to a special teacher or staff person that we will deliver at the beginning of the school year. We will also have some Pony Pride giveaways, including tattoos, pencils and stickers. Stop by and say "hi"! Be sure to look for us at the Lumberjack Days Parade on Sunday, July 23. Come cheer on our students as they show their school spirit! They'll walk along the parade route from Washington Square to Pioneer Park handing out Pony Pride items along the way. Go Ponies! 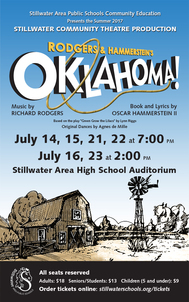 Community Education Community Theatre presents Rodgers and Hammerstein's Oklahoma! A high-spirited rivalry between the local farmers and cowboys in a turn-of-the-century territory makes a colorful setting for the romance between the handsome cowboy, Curly, and the winsome farm girl, Laurey. The road to true love never runs smooth, and with these two headstrong romantics holding the reins, love’s journey is as bumpy as a surrey ride down a country road. The school board will hold a closed session at 2 p.m. on Thursday, July 13, 2017 at Central Services to discuss properties and pending litigation, and to evaluate the superintendent. The school board has canceled its learning session scheduled for 5:30 p.m. on Thursday, July 27, 2017.